These instructions assume you are using a login other than Root. If you are using the Root login, you can skip the use of “sudo”. To make the JAVA_HOME variable a permanent value, you will need to edit the system profile file with the export command used above. Use vi, nano or your favorite editor and edit /etc/profile. Place the export JAVA_HOME=/… command from above as the last line and save it. Reboot your system and validate the java version and JAVA_HOME is correctly setup. We will now download and setup the SOLR install. The four commands below will need to be entered one at a time. This will download and untar the SOLR install files. Go to the SOLR5 Download Page to determine the exact http address to use for the wget command. Started Solr server on port 8983 (pid=). Happy searching! The Solr service is installed and running. This install will place all the code at /opt/solr and all your data for your cores will be stored at /var/solr. The data directory defaults to /var/solr, and is configurable with the ‘-d’-option. The script wil install Solr5 as a service, so that you can easily use sudo service solr start, sudo service solr stop etc. The script also creates a ‘solr’-user and -group which are used to run the server. 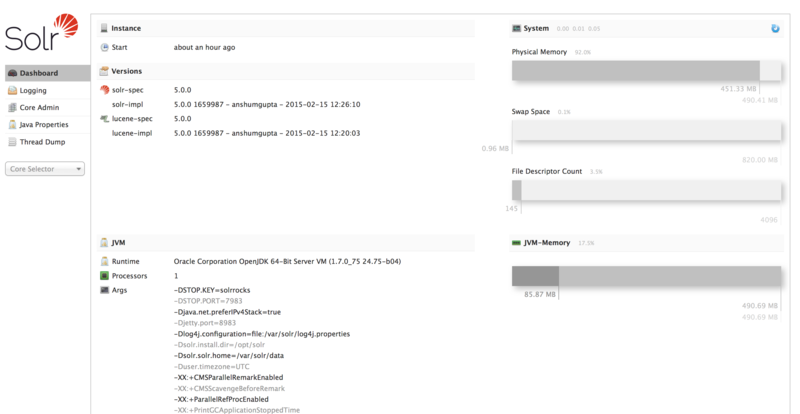 You can now go to the Solr admin panel at http://localhost:8983/solr/. Solr is now installed, but does not have any data. We will now create a couple of cores to allow you to start using SOLR. First we need to set the solr user as owner of the data directory. We will now create the first core called devel1. We will also load all of the Solr documentation into the core. Lets create the second core and load the sample xml documents. You know have two different cores to work with. You can follow the examples for loading different document types and searching at the SOLR QuickStart Guide. I hope this helps with your installation of Solr 5 on Centos 7. You will need to go to each of the core directories and create these files to remove the errors. This will remove the errors. This line was slightly off. 1. With SOLR 6 it appears to be necessary to run the create and post commands as the solr user or permissions problems will occur as detailed in https://issues.apache.org/jira/browse/SOLR-7826 I think. “. It may also be necessary to include the port number in the post command if you don’t use the standard port e.g. add -p 8080 to the end of the post command.